When I was in high school, I had a picture of Anne Rice hanging up in my room. No really. Some girls might have posters of the latest teen hearthrob but me? It was a postcard I bought at Barnes and Noble of one of my favorite authors. So it was very exciting to very briefly meet her at BEA and have her sign an ARC of her upcoming spiritual memoir, Called Out of Darkness. Which I'm dying to read, and would read right this second if I didn't have stacks of other books to read for review. Do any of you enjoy Anne Rice's books? I also got to briefly meet Jason F. Wright, author of Christmas Jars a book you really should have in your holiday book collection. It's just that wonderful. 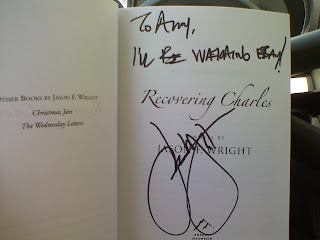 He signed an ARC of his upcoming Recovering Charles but I couldn't help but notice he was a little paranoid....;) In any case, I'm also dying to read this book, and would read it right this second, if I didn't have stacks of other books for review...yeah you get the idea. Right now I'm reading a book for the Spring Reading Thing, because I fell way behind when other books came in for review. It's a YA book, Wicked Lovely, but wow has it sucked me in! So far, I love it! I enjoyed Anne Rice's Christ the Lord: Out of Egypt. My book club acutally discussed the book around Christmastime. My husband and daughter are away camping this weekend, so I'm planning on getting a lot of reading done -- I finished The Reincarnationist last night. Now I'm reading The Wednesday Sisters. So far, so good! I've been really bad for reading lately...I have a couple on the go though, one being 'The Last Testament' by Sam Bourne and 'The Time Traveler's Wife' by Audrey Niffenegger. They aren't Christian fiction though and I got them on my trip to Egypt this past February...actually on the way home at the airport in Dubai. I am waiting for Wicked Lovely to come in. I just got in the second one, Ink Exchange. I've never read any books by Anne Rice. What is your favorite book by her? Jason...that's crazy. People are nuts. Julie..I haven't read that one, but I want to. Hope you caught up on all of your reading! I really want to read The Wednesday Sisters. Shelley...I read all kinds of books, but I haven't read either of those. Wait, Egypt??? I'm so jealous! J.Kaye...I read Wicked Lovely because I had the ARC for Ink Exchange, now I can't find it! ha! Angie, the classic, Interview with the Vampire.